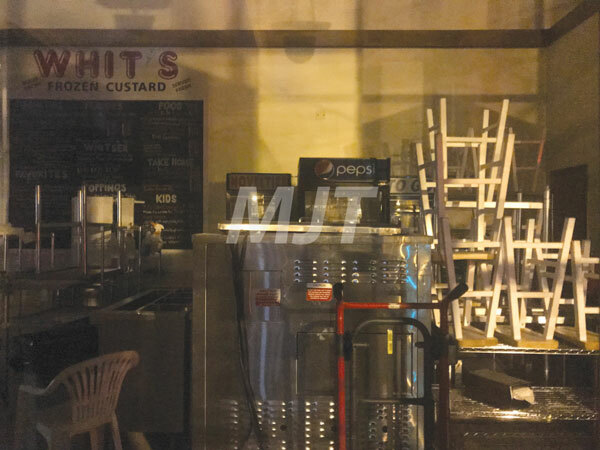 Equipment inside Whit’s Frozen Custard lays shuffled around after work was done inside to expand dining space. Poole said after the building’s landlord refused to pay for its share of the project, he decided to close the restaurant for good. According to Poole, the restaurant will hopefully come back to Marysville eventually. After five years of business, Whit’s Frozen Custard operator Todd Poole said the ice cream shop will not reopen this spring. Poole said the closure is the result of a strained relationship with the owner of the Whit’s building. According to Poole, he’d been trying to purchase the building outright, though the owner, Mason Equity Group, had refused to sell, hoping Whit’s would sign a longer-term lease. After Poole decided to make improvements to the second floor of the business, he entered an agreement late last year wherein Mason would pay for roughly half of the $90,000 in work to be done. All of the improvements Mason was responsible for funding would be permanent work to the building itself, such as roof repairs, heating and cooling and a warranty on the building’s aging plumbing system. “It’s a beautiful building, and we wanted them to take care of it,” Poole said. In exchange, Whit’s would go under a new 10-year lease. These improvements would have drastically increased the amount of seating in the building, and Poole mentioned public restrooms as a possibility. Poole said he hired contractors to do the work, though earlier this year it became apparent the building owner was unwilling to pay it’s share. He said the building’s property manager became unavailable, and when Poole attempted to contact Mason directly, the company began disputing the terms of the contract. The Journal-Tribune contacted Mason Equity Group, though a representative of the company said the company isn’t giving a statement at this time. According to Poole, the unfinished work inside the building has rendered it unusable. With the help of local attorney Tony Eufinger, Poole is still negotiating with Mason. While final terms have not been set, Poole said he’s decided to vacate the building. “We eventually came to the conclusion that it would be impossible to come to a sustainable agreement that would allow us to reopen,” Poole wrote in a letter. For the time being, Poole said he’s focusing on the Whit’s location in Bellefontaine. He said it’s possible to keep equipment from the Marysville location in storage until he finds a new location. However, he hasn’t had any luck so far. “We looked for a good while, and there’s just nothing there,” Poole said. Marysville City Manager Terry Emery said city officials have been working with Poole in order to find a new location. Officials say Mason is the owner of several properties in the Uptown, and he said they’re historically hard to deal with and contact. According to Emery, the closure of Whit’s is a “huge loss.” He said the restaurant is in a central location in the Uptown, and that it was regularly full of customers. “It’s been a great asset to our Uptown,” Emery said. Emery said the restaurant’s importance to the community is the reason officials are getting involved. Emery said officials are going to continue looking for places for Poole to relocate. He mirrored Poole’s statements, saying it’s not easy to find a place suitable for an ice cream operation. Despite that, officials are continuing their search. “We’re not ruling out trying to find out locations,” Emery said. While this closure stings, Emery said he’s confident the Uptown will remain healthy. He said the Uptown will continue to prosper. “We’ve got a lot of momentum,” Emery said. Poole said most of his employees have opted to work at his Bellefontaine location, which he said is encouraging. In the meantime, he’s focusing on getting feedback from the Marysville community. He said he knows the Uptown was a good location, though he could see the restaurant relocating out of that area if residents aren’t attached to it. Regardless, Poole said wherever Whit’s ends up in Marysville, he fully intends for it to be for the rest of his time in the business. “If we move, it’s going to be a lifelong move,” Poole said.